It’s wonderful when giggles of joy and excitement ring through the classroom as young students eagerly learn the skills needed to be proficient readers. Learning centers or reading centers are often the place where this can happen, but the trick to tickling your students attention often lies in multisensory, interactive activities or games. 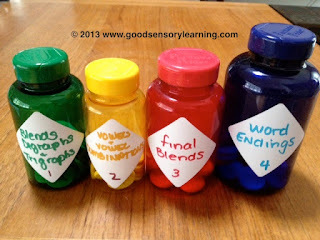 Here is a fun phonemic awareness activity I designed that you can make with old recycled pill or vitamin containers and other common household goods. It’s a wonderful learning center idea that will help students blend phonics sounds into words. 1) Collect and clean old vitamin or pill containers. I like to use the clear, colorful ones. 2) Decide upon the playing pieces. I use a 1 inch hole puncher with thick cardstock, large lima beans, or wooden craft discs. 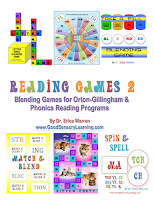 3) Place consonants, blends, digraphs, word endings or more onto both sides of the playing pieces. I like to color code the pieces to match the color of the container so that clean up is quick and easy. 4) Label the containers as illustrated or as you like. The object of the game is for players to select “a pill” from each container and try to make a word by blending the sounds. If a player can make one word or more, they write down the biggest word on a score sheet and collect one point for every letter used in their word. After each round, the playing pieces are returned to the appropriate container. Players shake the bottles and then select new pieces. After ten rounds, the winner is the player with the highest score. I am DEFINITELY going to be using this idea --- heaven knows I have enough "pill" bottles around here. What a neat idea! Thanks for sharing! just found your blog! Great ideas! This is a great idea! I can use this targeting speech sounds during articulation therapy! I am for sure going to use this idea. Now onto the hunt for bottles! This is fantastic!!! I found your blog via TBTS (I'm a new "student").